You know we love great events and only post the REAL! You know we rep Houston and especially got love for the Southeast! TONIGHT, SF2 will be in the building strong with our friends. Join us! Brisk and Noisey present Brisk Bodega Houston. 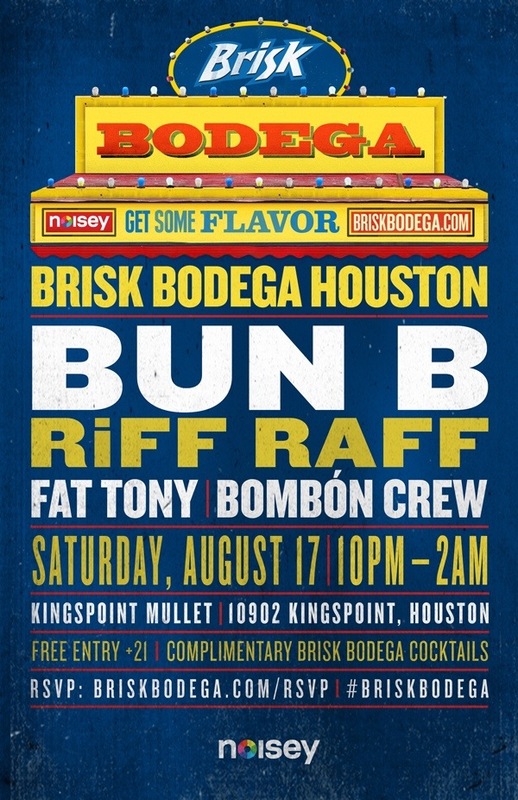 Bun B, RiFF RAFF, Fat Tony, and Bonbom Crew are coming to our old stomping grounds, the SOUTHEAST!! It all goes down at the Kingspoint Mullet TONIGHT! You know the spot, across from Almeda Mall west where we used to line up for kicks! ! Complimentary Brisk Bodega cocktails will be served all night! This alone is a great reason to attend! *Also, no bag check! Please leave your purses in your car. This entry was posted in Events, Music, Uncategorized and tagged art, BRISK BODEGA, BUN B, graffiti, NEFF, Noisey, RIFF RAFF. Bookmark the permalink.